7 Essential Off Road Items to Carry. Knowing what to pack is always a challenge. Here are seven things I never hit the trail without. The adventure began with the seven hour tow to Virginia. VIR is located like most race tracks in the middle of nowhere. But VIR is different in that you can’t get there from here. You have to go somewhere else first them go to VIR. If you are in Virginia there is no road to take to the track that does not go through North Carolina on the way. I looked at several options before choosing the fastest route according to Google maps. What I failed to notice in my route planning was the 9 mile long 9.5% down grade after getting off the interstate. Normally this would not have been too bad however just as I was stopping for fuel earlier I had noticed a warning on my brake controller. There was a short somewhere. When I got on the twisty section I had made a quick attempt at diagnosis and found that if I switched off the front brakes, the fault would clear and I had at least one axle of trailer brakes. Normally this is plenty but for the long steep down hill run not quite so much. I made my way carefully down the hill alternating between braking and cooling and lots of compression braking. I was very happy to get to the bottom after about twenty minutes of pucker. Tom met up with me in Danville to get fuel. But we decided it was too far to haul the fuel to the cabin and back so we fueled only the race car for the Holiday Laps session on Friday. While fueling we noticed there was still a lot of heat coming off the trailer tires. Evan booked us a nice cabin on the lake close to the track since there are no hotels nearby. The narrow driveway looked a lot like a Jeep trail but I found a place to park the trailer only a short walk from the cabin. It was dark and cold so I grabbed my gear and hopped in Tom’s car. The next morning at dawn, I went to look at what it was going to take to get turned around. As I was scouting the path out, I noticed something odd about the trailer. 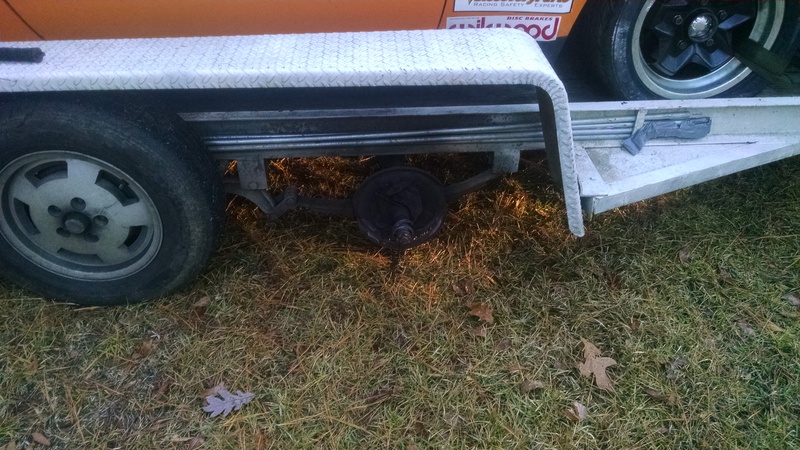 The right front trailer wheel hub and brake assembly was missing. In its place were a couple of worn bearing races. I have no idea when it left. I decided there was nothing left to do but drive on three wheels to the track and deal with it later. I had no idea how poplar the Holiday laps program is at VIR. My GPS said I was still a mile from the gate when I stopped at the back of the line. And I thought we had gotten there early. Anyway, we paid our entry and then found a place to park where we could unload the car and work on the trailer. We sent Evan out first and he got in a few paced laps. However when he came back the car was making a noise and the dash warning light was on. Popping the hood showed the alternator mounting bolt had backed out letting the belt slip. Unfortunately access to the adjuster requires removing our brake cooling duct. Not a bad job on the lift but a little awkward on jack stands in the parking lot. With her belt back tight we sent Tom out to get in line. The line was now about 500 cars long. Evan and I realized he was going to be in line a while so we took Tom’s car to tractor supply and found a hub and a wheel and tire. I also bought a chisel thinking I would hit the race and it would break off. The chisel was not near as hard as the bearing race and soon I just had a flat metal bar. Evan was able to find a grinder and cut off wheel with one of the better equipped teams. He also found a place to plug it in near where Chumpcar had tech set up. The cut off wheel made short work of the bearing races. I had the new hub and wheel on while Tom was still waiting in line. He decided to let me take is stint so I waited a bit more and then took some paced laps of the full course. It is a very nice track with interesting elevation changes and different types of turns. However compared to COTA it is a bit narrow. All the run off areas are grass. Tom got to wait in line again before he took his stint near the end of the day. We then bolted the brake ducts back in place and used the car to scoop a well-placed paddock spot before the trailers were allowed in. 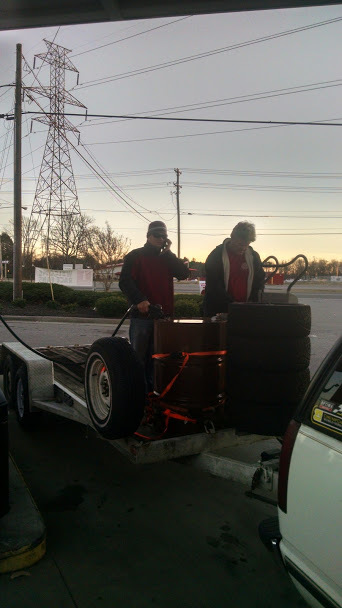 Afterwards we took the trailer out to get 110 gallons of fuel. But in the excitement, we forgot to buy a couple of gallon jugs of water like we normally do. We woke to a very cold morning on Saturday. We normally like to have our pits set up the night before but the track did not allow this. In fact it was almost time for the driver’s meeting before they allowed us in. We felt a bit rushed getting everything set up and somewhat organized. Evan took the first stint and turned some very respectable times. The car seemed to be running well and handling well once the new Hankook tires warmed up a bit. I took over for the second stint. I went slower being intimidated by the number of cars on the narrow track. I eventually got in the groove and had a good run. The only glitch being my radio microphone was not working. I could hear but not talk. We made a quick driver swap to Tom. However in just a few laps he was back in with the engine hot. This is when I realized we never bought water. I used water bottles from the cooler while Evan went in search of more water. I was able to burp the system and get Tom going again. Evan ended up buying a fuel jug from the pro shop to hold water for future stops. We put Evan in again in the afternoon. He was really mixing it up and turning fast laps when he got tagged by Neon in a critical spot. The impact sent him off into the grass and then hard into the tire wall. He then spun around and impacted the guard rail. In car video shows the violence of the crash. He was able to move slightly but had to get assistance back to the pit. The car still ran but would not move. I quickly diagnosed the problem as a broken half shaft. And I had bought a spare just in case. I crawled under the car and began removing the bolts. Thankfully none of them stripped out. We might have made it back on track on Saturday but the new in the box shaft had a problem that required it to be disassembled and reassembled to get the balls in place. I had Phil the chief inspector come take a look at the car and give his blessing before we took it back out on track. He also took a look at our in car video to see who had hit Evan to push him off. We had to tape up the broken rear hatch and straighten the frame a bit to get it to latch. Amanda said it felt like we were back in Harlan as we all worked together to get the car ready to race on Sunday. 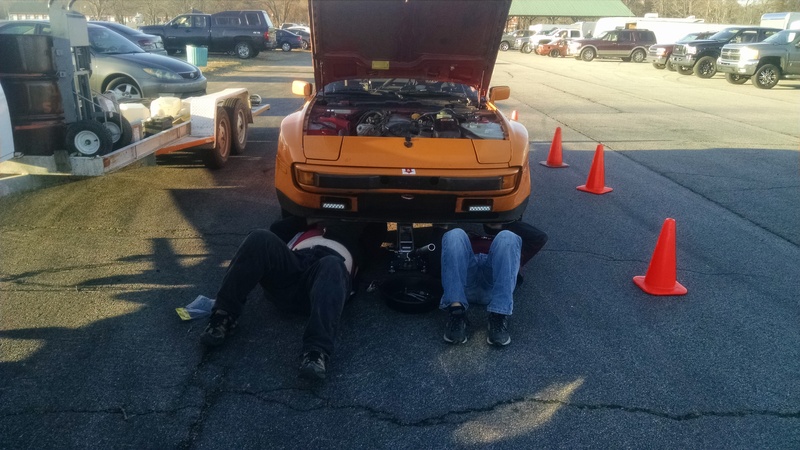 The other 944 teams stopped by to offer support and offered to loan us parts or tools as needed. On Sunday morning I took the car out to rejoin the race. I was tentative at first but I picked up sped as I realized the car handled just fine. The tape on the rear window blocked my view a bit and the missing door mirror caused more problems. But I was able to run my full stint and turn the car over to Tom. I did take the car to the paddock to torque the half shaft bolts. It was a good thing I did too since some had not seated well in the cold the night before. However in the process I suffered my least favorite moment of the weekend. Somehow I got my pinky finger pinched between the wrench and the wheel as someone outside the car tried to move the wheel so I could access the next set of bolts. 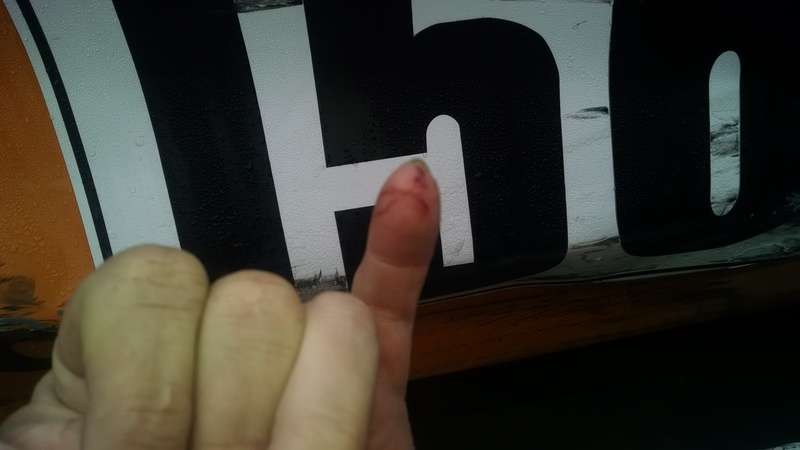 The worst part was having to bring it back across the pinch point to get my hand out. Jenny cleaned my injury and bandaged me up. Tom took over the car and headed back out on track. He was able to improve slightly on his previous lap times. We made a quick swap to Evan. He was turning really good laps when he called saying he had alternator issues. Remembering the Friday experience, we checked the belt tension but it was fine this time. We took it to the paddock for further diagnosis. My voltmeter was showing 14 volts at the battery but the dash meter was showing ten volts. Since the car was running fine I sent him back out assuming it was a wring glitch. I took over for my last stint of the weekend. I was finally getting comfortable with the close proximity of other cars and learning my way around the track. Then I noticed a stumble in the car in a few corners. I saw the voltage was steadily dropping on the digital meter in the car. I ran as long as I could but the stumble got worse and the engine began to cut out at times. I put it behind the wall and checked the system again. I still could not figure out why the battery read a higher voltage than the rest of the car. We reluctantly made the call to load it on the trailer rather than changing the alternator. I discovered after I got home that the battery was low in my voltmeter which made it give incorrect readings. Overall it was quite an adventure. I was reminded of Neal’s comment: “racin’ is ‘spensive.” I do kinda wish I had changed the alternator and taken the car back out for what remained of the race. Just to say we didn’t quit. But we did gain a lot of new friends and respect among our fellow racers that we were able to get the car back on the track during the overnight stop. It was a long drive home in the rain but I made it home safely taking a different route that avoided the 9 mile 9.5% grade. We ended up in 42nd place. 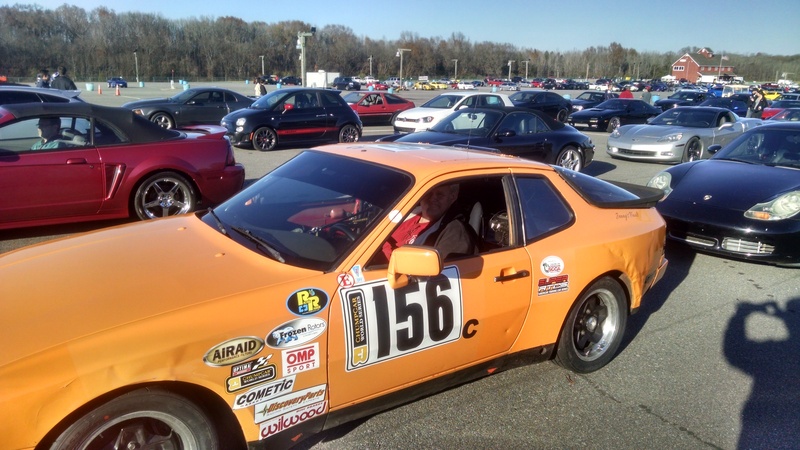 I think we turned more laps than two of the other 944s. 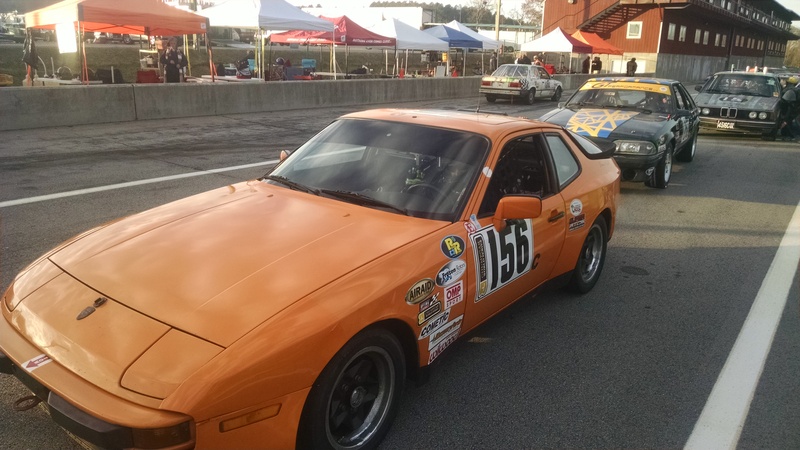 Visceral Racing’s 944 ended up in 38th place. 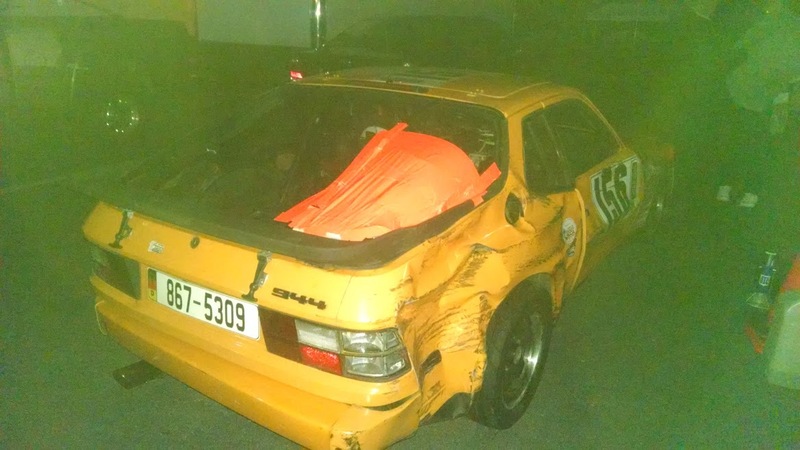 All the 944s had issues both days. Our plan is to have the car ready to race by the February event at Road Atlanta. Once again, the XJ list met for its semi annual outing in the Harlan, Ky. We had to change campsite this time due to Rock Buggy race scheduled at the new race track in our normal camping spot. We stayed in spot 4 instead of 3 at Harlan County Campground. This might have been a nice spot out of the wind but recent logging had made it a muddy mess with barely enough room for tents and tow rigs. We made the best of it with big fires each night made with scrap left from the loggers. As usual, the stars were amazing under the dark night sky of the back country. While the view was not great, being in the cove blocked the worst of the wind. On Thursday, we had a small group and took a run at Mason Jar. 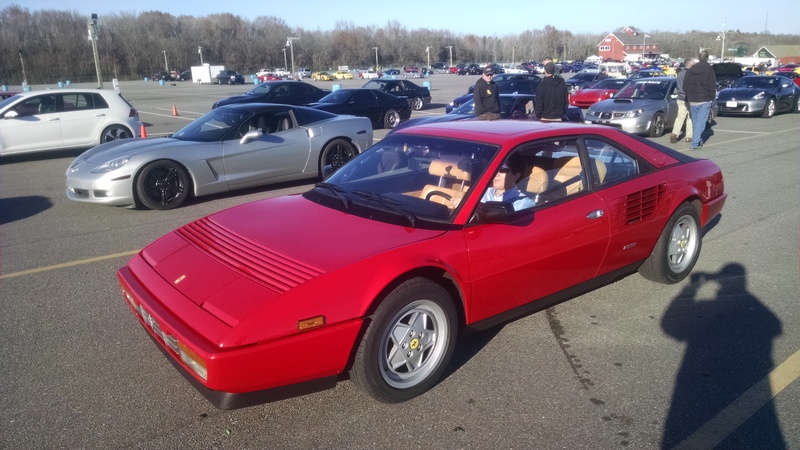 We made an interesting observation that this group had only manual transmissions. Normally we have about an even mix of autos and stick shifts. However, in this group, everyone got to exercise their left leg. The Toyotas played on the big rocks at the entrance while the XJs took the scary and still challenging left line. Took us about an hour to get the first fifty feet into the trail. We soon picked up the pace and noticed the trail has changed dramatically over the last ten years. Places that were hard are near impossible but there are new passages that have their own challenges. We all took various lines just to see what they were like. Neal had a break in his air system so he had to run most of the trail with open diffs since his ARBs require pressure to lock. I got hung on a rock and needed a short tug with my winch. However when I got the cable good and tight the winch failed. Would not go in or out. I was seriously stuck until Frosty turned around and gave me enough of a tug to release the clutch and free the winch. We made it back to camp just after dark. We built a huge fire to ward off the cold and clean up some of the logs. Friday we had a few more rigs. We headed up trail 15 and had lunch at the helicopter pad. We played on the White Tail climb until Brian broke his rear yoke and had to be rescued. He drove back to camp in front wheel drive via the paved road stopping at a junk yard to get parts along the way. The rest of us headed to lower rock garden and made a few passes on the beginning. Frosty and Dean played on the waterfall near rail bed and Frosty ended up breaking an axle shaft. We then hit Fish Fossil. I had to back out of this trail last year so I was excited to lead the group in this time. Still with no winch, I was determined to make it. Neal’s expert spotting helped me get over the little water fall in the middle. However the long climb at the end was rutted too deep for my 33″s. I had to try to straddle the ruts. My first three attempts had me sliding into the ruts and having to back down. We finally sent a winched jeep up to give me a tug. I hit it again and this time held on almost to the top. Just a few feet from the top I slipped into the rut again. More throttle from my 4.7 storker motor was probably not the best choice but I was giving it a go. Then there was a snap and the left front wheel stopped turning. Thinking it was just a U joint, I tried again. Then the front wheel gained LOTS of camber. I accepted the cable and as I was drug to the top the wheel was separating more and more from the Jeep. The lower ball joint was gone. Is was nearing dark so while the other made their way up the hill, Evan made a rally racer run taking me back to camp to get the trailer. We made the long drive around the mountain to come in form Evarts. With lots of help and some ratchet straps I got it on the trailer and made the long run back around to camp. I figured I was done for the weekend and even wondered how I would get it off the trailer when I got back to the shop. In the daylight I saw it was just a ball joint and not the axle C. Scott had his ball joint press and as a group we had all the tools I needed. I picked up some ball joints from the parts store in Harlan and an hour later I was back on my wheels ready to ride. Thanks to all who helped me wrench, hammer and press the new parts into the damaged axle end. We headed up the trail 45 which has become quite a challenge in its self. It took awhile to get every one to middle fork. We then decided to take the easy way (20) to lower rock garden. Along the way one jeep took a bad line through a wash and ended up on its roof down an embankment. We spent the rest of the day recovering the Jeep and getting it back to camp. This extraction was an amazing feat of team work and recovery skills. No one was injured and the XJ made it way back to camp on it wheels. It ran most of the way but having lost most of its vital fluids during its long time upside down it suffered some drivability issues. We got back to camp just after dark again. We made our usual delicious steak and potato boats. After that there was wood chopping demonstrations and other “manly” games. Once again the events of the weekend showed me the benefits of good friends and working as a team. These are the reasons I enjoy wheeling with this particular group. Right now I am in a narcissistic game of tug of war. I’ve been working with my best friend for months on building up his self esteem so that he can see he has value and build trust with people. That was taken away from him over 30 years ago. You see, I am his wife’s ONLY “friend” although lately, I have been mainly viewed by her as the enemy. Once my best friend discovered his wife has no doubtedly, narcissistic personality disorder, I began doing a lot of research. Since I am pursing a nursing degree and was in Abnormal Psychology, I was able to ask a lot of questions from my professor. At first she blew the situation off as if it could be something else. That was, until I started thoroughly describing behaviors and then her jaw dropped. I have been learned to play this narcissism game and let me tell you, her true self has reared its head. Just last week my best friend seen a side of his wife he didn’t expect to see although he was somewhat aware of the possibility it would happen. One of the things I have been working on in myself, since I too became a “victim” of this narcissistic vampire has been to stand up for myself. You see, for years I allowed things to be in her court. I had tried in the past to reason with her, argue my point, defend others (especially her husband) and even help her when she asked for it. All of that was in vain and usually she was the “winner.” I always felt like an object to her anyways. I mean one day I was her best friend in the world, the next day it was if I didn’t exist, mean a thing to her at all whatsoever. Even before the discovery of NPD I had pretty much started to detach myself from her. She would ask her husband why I would only come out to the house when he was there or why I wouldn’t text or call her like I used to. Well, it’s because I got sick and tired of being treated like a doormat for her to clean her boots off with. It’s taken a lot longer for my best friend to realize how deeply serious this situation is. After all, he has been sucked into this vampirish nightmare for over 30 years. I am proud of him though for realizing that he has to be the one to take control of his life again. For years he left the ball in her court, for her to make the decision to leave or stay. There were times she would threaten to leave but never would. It was just a few years ago he finally let her know he no longer wanted to be married to her. And of course she felt like she was nothing anymore since he no longer “wanted” her. As typical as it is with her, in a day or two it was if nothing had ever happened. Stuff like that has driven my best friend and I nuts. Her being aware of something one day and the next day it was as if a reset button had been pushed. Lately though things have been taken up a notch with her saying off the wall things. It was almost two weeks ago when I had gone to Wal-Mart to have my prescription medications filled and had seen her driving into the parking lot. I had text her but heard nothing back for about an hour. Then she calls me and asks me which vehicle did I see her in? Okay, here is the deal: she only drives ONE vehicle and that is her Jeep. 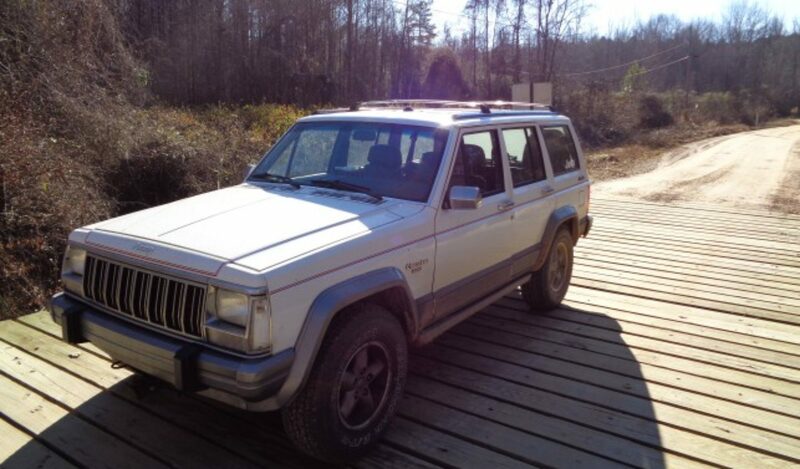 Everyone who knows her knows her Jeep and how she is about it. Apparently that same day my best friend said that she asked him if he had driven his car…ummm the car is parked next to her Jeep in the garage, so if she made a trip to Wal-Mart she would have noticed the car was still in the garage. Another bizarre incident happened around that time when she and I had gone to get lunch one day. She made this odd ball comment about me being just a few months older than her niece. The thing is, that is not true. It is true that her oldest son is just a few months older than his cousin, but I am Nine years older than the two of them! I still find myself being underminded by her as I am gritting my teeth ready to put my hands around her neck. Every time I am around her of course she starts her bragging about this or that. Usually I am rolling my eyes and trying to tune her out. My teenage daughter has even become aware of the situation, often asking me questions about things. Of course, she knows why I continue to stick around. Why am I still around her? There are a lot of reasons why. Some are deeply personal. Two main reasons: I am pretty much the ONLY person who is completely aware of the situation and the person who is the support of my best friend. I saved him in the nick of time, from committing suicide years ago. He was ready to end it all because he felt useless, as if no one cared or even appreciated him and his worth. My best friend is an amazing person who is adored by many around us. He is incredibly talented, smart, savvy, and also extremely caring. The latter one is his biggest weakness. I have watched him become the doormat to several people which has at times caused strain between the two of us. In the case of his wife though, he is fully aware that I am at the point I will not back down, I will be aggressive and I will be doing a lot of speaking out. I have already been doing these things with some interesting results. That of course has begun to irk his wife. And her true self is being revealed. I can recall in childhood my hands mysteriously swelling and remembering how painful they would get. I just assumed it was related to my Asthma getting ready to flare up. I remember having some difficulty swallowing and sometimes getting painful indigestion assuming it was related to food allergies. It wasn’t until I was a grown adult, mother of three kids that things started to fall into place. I still had my hand swelling issues sporadically, but then it started in my face and feet. Another scary issue emerged about a decade ago with me having difficulties swallowing. Back then it was as if I had not chewed up my food enough. Now, it sometimes gets to the point the food gets stuck where I cannot swallow, cough it up or breathe. My last incident with the swallowing was about three weeks ago when I went out to eat with my family. I had one of those moments of shear panic as well as embarrassment when I went to swallow and the food got stuck. I tried drinking and it came back up because there was no where for it to go. It even came out of my nose and I was scared because I couldn’t do anything productive for a short time, which felt like an eternity. I have had worse moments in the past though. I remember going to a WIC party for my youngest son at the local health department about six years ago and eating, then my food getting lodged in my throat. I was in horrible pain, could not swallow and I couldn’t drink anything. One of the nurses took my son so I could go to the bathroom. I couldn’t cough it up and I was trying to force myself to throw it up and I couldn’t. After about 30 minutes of going back and forth to the bathroom, I finally was able to swallow. Why I have waited so long to do something about things is for several reasons. There were times I did not have insurance, I don’t like doctor’s offices and I honestly thought no one would believe me. Then recently, things had started to get more mysterious. Every so often when I would get in the shower, my face, lips, hands and/or feet would just swell. I first assumed it may have been from shampoo or soap or even what the towel had been washed in. However, all the soaps used had been soaps I have used for a very long time. Still though, I thought no one would believe me. A few days ago during a shower, the right side of my face really started swelling and then my lips. It was scary to look at my face in the mirror. That same day I went out shopping with a friend and noticed my hands were mysteriously swelling. I tried pushing the shopping cart, which was a big mistake. My hands started really swelling to the point it hurt. I waited about three days and then went to go get my allergy shots. It was then I shared with the nurse about the swelling issues. She immediately insisted I go make an appointment to get in to see one of the drs or FNP’s. Luckily for me there was an opening the next day. I still thought though that it would be chalked up to minor things. I did my routine questionnaire thing, then the spirometer for my Asthma, which was great. Then the FNP came in and started asking me questions. See, I have been having constant (almost daily) indigestion. My throat is still swollen even after the incident weeks ago. I have also started having severe bouts of nausea almost to the point of vomiting. There are times I have had attacks of diarrhea for unknown reasons although I assumed it was either something bad I had eaten or something I had eaten that I could be allergic to. After going over everything I have been experiencing, the FNP strongly suspects I have Angioedema. She immediately ordered blood work (like 6 vials). There is suspicion I have the hereditary form of AE, or HAE. My maternal grandmother had Lupus and I believe she also had angioedema as I remember her often being in pain from swelling. For once I was relieved that someone believed me about the strange things going on with my body. It was scary though to read about what angioedema is besides what my FNP shared with me about it. My epi pen won’t work with attacks, if my throat starts swelling I have to immediately go to the ER and typical antihistamines will not work, which makes sense since I have remembered in the past taking antihistamines and still being miserable as all get out hours later. In early 2013 I will be doing a more thorough food allergy test and also see a gastroenterologist. For now, it is a wait and see game to see which form of AE I have and then go from there.